Brewer's yeast is a type of yeast created as a byproduct of beer brewing. It is typically used in alternative medicine to promote digestive health and is believed to treat a number of health conditions, including colds, flu, diarrhea, and diabetes. Brewer's yeast is the dried, deactivated cells of a fungus known as Saccharomyces cerevisiae. It is a rich source of B-complex vitamins, protein, and minerals, including a biologically active form of chromium known as glucose tolerance factor (GTF). This makes brewer's yeast a potentially useful "natural" nutritional supplement. Brewer's yeast used should not be confused with beer yeast used for making beer or active dry yeast used for baking. Unlike these types of active yeast, the cells in brewer's yeast are non-living and cannot be reactivated. Saccharomyces cerevisiae should also not be confused with Saccharomyces boulardii, a type of yeast commonly used as a probiotic. The evidence supporting the health benefits of brewer's yeast is generally lacking. Nevertheless, alternative practitioners believe that the nutrients in brewer's yeast can aid in the treatment of digestive problems (such as diarrhea and colitis), respiratory conditions (including colds, influenza, and hay fever), and chronic disorders such as diabetes and high cholesterol. Despite its use as an anti-diarrheal remedy, there is not much proof that brewer's yeast can actually help. The one exception may be its use in treating diarrhea caused by the bacterium Clostridium difficile (also known as C. difficile). Most of the evidence supporting this claim dates back to research conducted the 1990s and early 2000s. One study from the University of Pittsburgh found that brewer's yeast was able to relieve C. difficile-associated diarrhea in rats by reducing the secretion of water and electrolytes from the colon by around 50 percent. Results from similar studies have been mixed. The use of brewer's yeast in treating other types of diarrhea, including antibiotic-associated diarrhea, has not proven effective. Brewer's yeast may be useful in treating irritable bowel syndrome (IBS), a digestive disorder characterized by abdominal pain, gas, diarrhea, and constipation. According to a 2017 review of studies in the World Journal of Gastroenterology, people with IBS provided brewer's yeast were 51 percent more likely to experience at least a 50 percent reduction in IBS symptoms compared to placebo. The conclusions were limited by the small size of the reviewed studies. In the end, only two trials met the criteria for inclusion for a total of 579 participants. Brewer's yeast is believed by some to treat the common cold, flu, and other upper respiratory tract infections. While the exact mechanism of action remains unexplained, proponents claim that brewer yeast increases the immune response in a way that helps the body "treat itself." There is some evidence of this, albeit weak. A 2012 study from Utah reported that women provided a daily brewer's yeast supplement called Wellmune had 60 percent fewer upper respiratory tract infections after 12 weeks than women provided a placebo. Despite the promising results, brewer's yeast did nothing to reduce the severity or duration of illness in people who did get sick. This suggests that S. cerevisiae has little, if any, antiviral action and is unable to directly treat an infection. Glucose tolerance factor (GTC) found in brewer's yeast is known to enhance the insulin response. It does so by binding to insulin and increasing its absorption in blood vessels by nearly three-fold. This action can be especially beneficial to people with insulin resistance. A 2013 study in the Journal of Preventive Medicine reported that adults with type 2 diabetes given 1,800 milligrams of brewer's yeast per day experienced a 9 percent drop in their fasting blood glucose after 12 weeks. By contrast, participants given a placebo had a 7 percent increase in their blood glucose levels. A 2013 study from Iran further demonstrated that the same dose of brewer's yeast (1,800 milligrams per day) improved blood pressure in people with type 2 diabetes, reducing the systolic (upper) pressure by an average of 4.1 mmHg and the diastolic (lower) pressure by 5.7 mmHg. Despite these findings, brewer's yeast has little to no effect on HbA1C levels and is not considered an effective treatment for diabetes. With that being said, it may be worth exploring if you have prediabetes and want to take steps to avoid progressing to type 2 diabetes. Brewers yeast should not be used in people with a yeast allergy. Brewer's yeast should be avoided in people on diabetes medications as it may cause an abnormal drop in blood sugar (hypoglycemia). Brewer's yeast can make inflammatory bowels diseases like ulcerative colitis and Crohn's disease worse and should be avoided. Brewer's yeast may cause harm to people with compromised immune systems (including organ transplant recipients and people with advanced HIV) by triggering an opportunistic fungal infection. While brewer's yeast may pose a hypothetical risk to women with recurrent yeast infections, the risk is considered low. With that being said, you may want to avoid brewer's yeat if you have an active yeast infection. Due to the lack of safety research, brewer's yeast should not be used in children, pregnant women, and nursing mothers. MAOIs work by preventing the body from breaking down tyramine, a substance found in large amounts in brewer's yeast. If taken together, MAOIs can prevent the body from breaking down the excess tyramine as it normally would. The excessive build-up can lead to a dangerous rise in blood pressure, known as a hypertensive crisis. A hypertensive crisis may also occur if you take brewer's yeast with the narcotic Demerol (meperidine) used to treat moderate to severe pain. 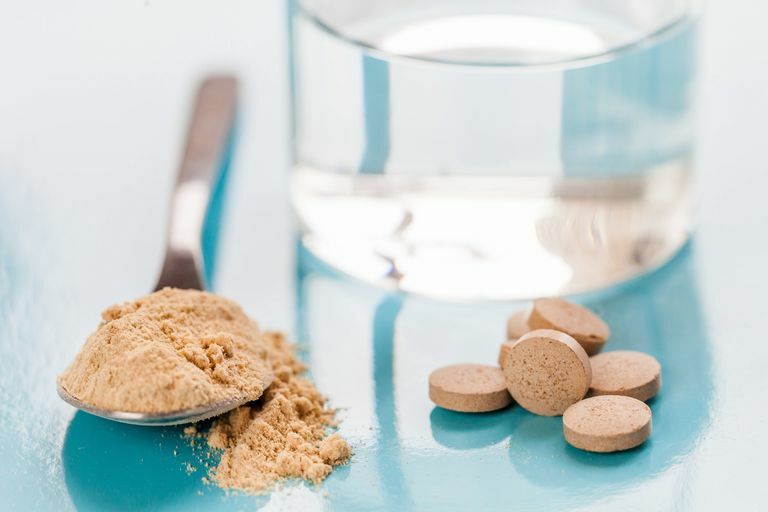 Brewer's yeast may also potentially interact with antifungal drugs such as Diflucan (fluconazole) Lamisil (terbinafine), and Sporanox (itraconazole) use to treat fungal infections. Brewer's yeast is available in tablet and powder forms. There are no set guidelines on how to use brewer's yeast safely or effectively. Brewer's yeast tablets generally come in doses ranging from 250 milligrams (mg) to 1,000 milligrams. A daily dosage within this range (or up to 2,000 milligrams per day) is considered safe if taken for no longer than 12 weeks. Brewer's yeast powder is usually mixed with water or other beverages. Most manufacturers recommend one to two tablespoons per day as a nutritional supplement. Because brewer's yeast has a bitter flavor that some people find off-putting, it often helps to mix it into a smoothie or juice. As a rule of thumb, start with smaller doses of brewer's yeast and gradually increase over several days or weeks as tolerated. Never exceed the recommended dosage on the product label. Not all brewer's yeast products are created equal. This is especially true of powdered brewer's yeast which can vary from one brand to the next. While powders can are cheaper than tablets, be sure to comparison shop to find the brands with the highest nutrient content. Brewer's yeast is readily found online and can be purchased at many health food stores, drugstores, and shops specializing in nutritional supplements. Is brewer's yeast the same thing as nutritional yeast? Brewer's yeast is derived from Saccharomyces cerevisiae as the byproduct of beer-making. The yeast cells are harvested, pasteurized, and deactivated as part of the manufacturing process. Nutritional yeast is also Saccharomyces cerevisiae but is not a byproduct of brewing. Rather, it is specifically grown on a medium such as corn, rice, or other types of grain. Although they are essentially the same thing, brewer's yeast has a bitter flavor while nutritional yeast has a somewhat nutty and cheesy taste (as well a flakier texture). Because of this, vegetarians and vegans will often sprinkle it onto pasta like parmesan cheese or swirl it into a cream or cheese sauce. How can you tell beer yeast from brewer's yeast? While brewer's yeast is readily available in drugstores and health food stores, beer yeast is found almost exclusively in wholesale or retail businesses servicing the beer brewing industry. With that being said, beer yeast is often labeled a "brewing yeast." Unlike brewer's yeast, it is still active and can be bloomed (grown) to give beer its yeasty taste and fizzy carbonation. The same applies to the term "baker's yeast," which some people use to describe brewer's yeast and others apply to active dry yeasts used to leaven bread. Because of the potential for confusion, store your brewer's yeast with your daily vitamins and medicine rather than in the pantry or spice cabinet. If consumed, beer yeast or active dry yeast can cause extreme gastrointestinal distress as the yeast cells start to multiply, bloom, and produce carbon dioxide. If you accidentally eat either of these, call your doctor immediately. Cayzeele-Decherf, A.; Pélerin, F.; Leuillet, S. et al. Saccharomyces cerevisiae CNCM I-3856 in irritable bowel syndrome: An individual subject meta-analysis. World J Gastroenterol. 2017 Jan 14; 23(2): 336-44. DOI: 10.3748/wjg.v23.i2.336. Hosseinzadeh, P.; Djarayery, A.; Mostafavi, S. et al. Brewer’s Yeast Improves Blood Pressure in Type 2 Diabetes Mellitus. Iran J Public Health. 2013;42(6):602-9. Hosseinzadeh, P.; Javanbakht, M.; Mostafavi, S. et al. Brewer's Yeast Improves Glycemic Indices in Type 2 Diabetes Mellitus. Int J Prev Med. 2013 Oct;4(10):1131-38. Izadnia, F.; Wong, C.; and Kocoshis, S. Brewer's yeast and Saccharomyces boulardii both attenuate Clostridium difficile-induced colonic secretion in the rat. Dig Dis Sci. 1998 Sep;43(9):2055-60. Talbott, S. and Talbott, J. Baker's yeast beta-glucan supplement reduces upper respiratory symptoms and improves mood state in stressed women. J Am Coll Nutr. 2012 Aug;31(4):295-300. Can Fenugreek Help Increase Your Breast Milk Supply?